Engage Employee is an effort to help organizations understand and improve employee engagement, which is a fundamental building block for great customer experience. Compared with disengaged employees, highly engaged employees are 2.5 times as likely to stay at work late if something needs to be done after the normal workday ends, more than twice as likely to help someone at work even if they don’t ask for help, more than three times as likely to do something good for the company that is not expected of them, and more than five times as likely to recommend that a friend or relative apply for a job at their company. Seventy-seven percent of employees in companies that have significantly better financial performance than their peers are highly or moderately engaged, compared with only 49% of employees in companies with lagging financial performance. Companies that outpace their competitors in CX have 50% more engaged employees than those with CX that lags their peers. Ninety-one percent of highly engaged employees always or almost always try their hardest at work, compared with 67% of disengaged employees. As part of our commitment to Engage Employees, Temkin Group will continue to research and write on the topic of employee engagement. As a primer, check out Temkin Group’s Employee Engagement Resource Page. We hope that individuals will pledge to Engage Employees within their organizations and will share their innovative approaches with others. To take the pledge, simply write, “I pledge to Engage Employees,” in the comment box below, and proudly display this badge wherever you like. We hope that you will also share your most innovative activities that have successfully engaged employees in the comments section below. Use the hashtag #EngageEmployees to get the message out on Twitter. Congratulations to winners of our Engage Employees Challenge: Nancy Gallant, Sibylle Huffman, Roger Pugsley, and Lisa Hrnken Ramirez. You can see all of the submissions in the comments on this page. To encourage people to share their innovative practices, Temkin Group chose four people who we believe submitted the most innovative ideas for Engaging Employees and awarded them each a $250 gift certificate to Amazon.com. While the contest is over, we still hope people will share their ideas for engaging employees. The bottom line: Together, we can Engage Employees! Laura, thanks for being the first to make the pledge! I pledge to Engage Employees! As part of the Change Management Planning Team which supports a number of Customer Contact Centres across the country we have been demonstrating the value of engaging employees to increase the rate of adoption of change. To achieve this we have developed an Employee Engagement Model with engagement activities across the Planning, Implementation, and Benefits Realization phases of projects. • Employee Action Teams: Frontline & Management teams that are impacted by the change. Responsible for providing insight and recommendations on training, communication and implementation of ‘initiative’ at stages of the change. • Employee Engagement Advisory Council (EEAC): A subset of the Employee Action Teams are selected to join members of the project team and business representatives at this council. The Advisory council acts similar to a steering committee and is responsible for reviewing and signing off on communication, training, and benefits realization recommendations to sponsors. o Complete a PCM assessment with EEAC. The goal to this activity is to identify desired behaviours, mindset and attitudes for employees & identify strategies to mitigate impact to employees. o Conduct Action Teams (management and frontline): gather feedback and recommendations on implementation, communication and training.  Gather feedback from pilot group identifying areas of opportunities and recommendations for addressing any opportunities.  Incorporate learnings & feedback into the training i.e. support tools, FAQs, etc. Nancy, I think what you’re doing is great! Keep up the good work. As an organization that assesses and recognizes Employer of Choice contact centers, we know a thing or two about creating an engaged workforce and it sounds like you’re well on your way. I pledge to Engage Employees!! I am the Operations Manager of a large corporation (100+ employees, 18 Mil in sales) and I decided to be available to everyone. I moved out of my office and set up a kiosk to work from at a location that everyone (field staff, warehouse personnel and office staff) passes by several times a day. Some people have said it is like the desk sergeant in the old cops and robbers movies. Being visible and accessible has increased not only my effectiveness, but also has allowed all employees “equal” and more importantly “easy” access to the day to day operations of the business. Many times a person may have an idea or comment that is not only relative, but genius and having to make the trek to the Admin area of the building can often dissuade or postpone the the necessary interaction that has made this company great. Of course there are times that privacy is essential, but I have chosen to make that my burden instead of the trade off of missing out saying “good morning” to just about everyone and having those casual conversations that allow me to take the pulse of the company. I would recommend that more managers come out of the walnut and brass cave and into the sunlight of free expression and interaction. Employees love to be recognized, not just for big successes and long nights spend on projects, but also their every day efforts. In my group we have implemented giving ‘Pats on the Back’ many years ago to improve morale and teamwork. The concept was simple. All my staff were asked to do is to give a ‘Pat on the Back’ to a coworker, staff member, or peer for any act of kindness and support given to one another, regardless of how big or small the gesture may be. In return, anyone who earned 5 ‘Pats on the Back’ received a $25 gift card to a place of their choice. Building an environment where support and positive attitudes are encouraged creates an infectious atmosphere and culture that makes them feel appreciated and constantly motivates employees to do more. When gift cards are handed out to the staff, it’s a big deal. The team gathers together and every recipient receives a round of applause while the gift card is handed to them, creating another moment of pride.The team has become an incredibly cohesive, supportive, and high functioning group. A small gesture, and oftentimes just a simple ‘thank you’ can go a very long way in making employees feel valued and subsequently engaged. I have found many times that the key to success is consistency. Our groups philosophy of giving ‘Pats on the Back’ is spreading throughout the organization. Choose your attitude in the office and don’t forget to say thank you for the big and little things that way to frequently go unnoticed because we are all too busy. I pledge to Engage Employees!! I pledge to Engage Employees. I have an SME with 12 staff and we all work collaboratively, on a level playing field, to develop innovative technology and ways of engaging people (employees, consumers, suppliers) to derive rich emotional insight and answer the ‘why?’ question. We’ve just finished working with an awesome organisation – LinkedIn – to help them engage their employees in an online community that sought to help them understand their employees emotional issues and areas of concern and develop an innovative new Learning & Development platform. Their people ( we try hard not to label people as employees or customers if we can help it!) that took part were engaged in structured collaboration exercises and as well as delivering powerful insight that helped LinkedIn make better decisions, the initiative resulted in massively motivated staff, evangelists and active contributors that felt respected, rewarded and in a a great place. For all involved, it was inspirational. We all need to do more of this! I work / support a Total Customer Experience program as a Partner Advocate for a large Fortune 500 company (60K employees). We focus on continuously listening, responding and follow through with our customers and partners. I focus on end to end programs / processes from a customer’s perspective (direct does differ from Partners), working with SME’s and Partners globally. The only way to be successful in engaging the various functions to effectuate change is through total unbiased transparency, and by empowering, supporting and recognizing everyone for their contributions and efforts. Provide the Platform and they will come! We have implemented an Intranet site we call “oPositive”. Picture a Pinterest lookalike site allowing employees to post stories with Facebook functionality (other employees can like, comment or share stories). Employees are sharing an average of 50 stories per month on anything to do with CX: best practices, successes, customer feedback or recognizing their peers who have exceeded customer expectations. It’s fun, uplifting, and very engaging! We also mine the stories to identify winners of our annual “Customer Service Excellence” and “Story Teller” Awards. We have great people with great ideas. We therefore leverage oPositive content to feed “Site Initiatives We Love” to share great ideas and best practices with other sites across our portfolio. Collaboration is alive and well at Oxford! Having worked in my previous company for 17 years I started with another FMCG business just under a year ago, a growing and evolving business. I have inherited a team of 11 people, who, between them have approximately 60 years service – interesting times ahead, the business is growing at a fast pace, and huge focus is now being placed on employees and also employee development. It is not only engaging employees that is at the top of my agenda but ensuring they have a passion for ‘what they do’ I believe this is also core to the customer experience; challenging times ahead for a team who have a new manager instilling into them the value of themselves to the business and that ‘it’s not just a job’ ! At NetSpend, we like to engage employees from their first day on the job. We created a new employee “scavenger hunt” using the mobile app Scavify. The hunt guides new employees through a series of tasks that connect them to other employees, our mission and our customers. Activities include having lunch with someone in another department, taking pictures with a tenured employee, listening to customer service calls and using our product features to name a few. Now new employees have a fun way to learn about the company, their fellow employees and our customers. New employees also get to show their unique personalities as the upload pictures of themselves accomplishing the tasks. I pledge to Engage Employees by connecting employees to the value they bring to the organization while having fun in the workplace! 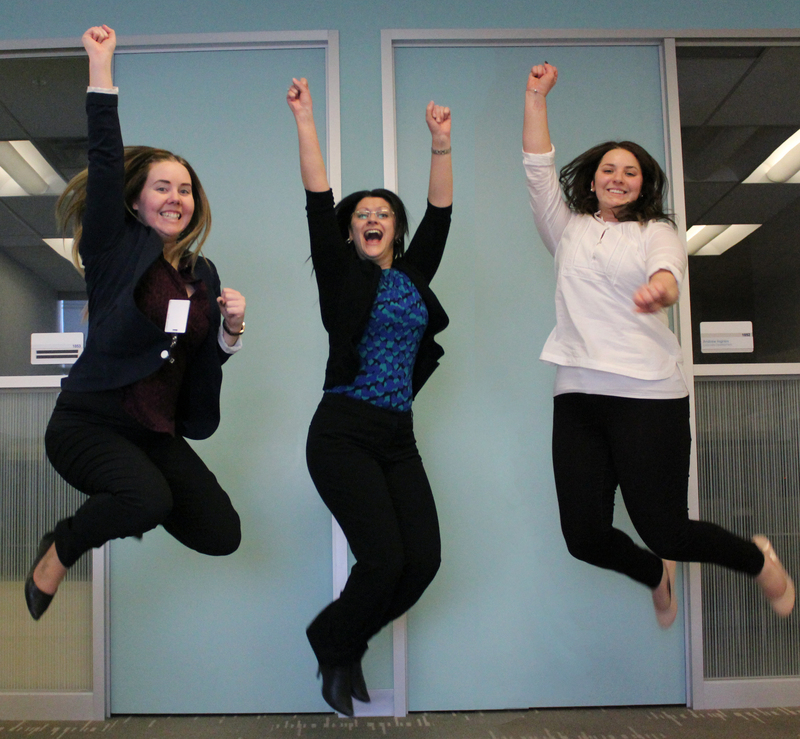 Bringing excitement and enthusiasm to customer service through training programs that encourage employees to LEAP to service by snapping a jumping photo.